We wouldn't say Sony has entirely lost its way in design terms, but it hasn't been setting the aesthetic pace quite as it used to. The KDL-32NX503 LCD TV marks a deliberate attempt to change that, courtesy of a new 'Monolithic' design that's gone down well at recent technology shows. But how does the design hold up in the living room? And does the 'Network' TV marketing badge actually mean anything? The all-important design certainly is striking, thanks in particular to the sheer, single-layer fascia, boldly chunky black surround and the way the screen tilts back slightly on its stand. However, the impact of the 'monolith' is reduced by the TV's surprisingly ample rear end. The single glass top sheet of the screen fascia reflects a lot of light and objects, which can become quite distracting. The 32NX503's other big selling point, its networkability, kicks in with its connections. For alongside four HDMIs you will find an Ethernet port and a USB input, both capable of multiple talents. The Ethernet provides access to future interactive features that may come from the set's built-in Freeview HD tuner. It also enables you to access files on a DLNA PC and Sony's new Bravia Internet Video service. The volume of optimised services available via this platform is outstanding, with dozens of video streaming services including LoveFilm, Demand Five, YouTube and Eurosport video news. The video streaming system is also impressively stable, even using a simple 2MB broadband connection, and with the set also supporting the sending of video links directly from your PC to the TV, the 32NX502 really does live up to its Network TV billing. Elsewhere, the set carries Sony's latest Bravia Engine 3 video processor and Live Colour processing for richer saturations, and a mode for boosting whites. The 32NX503's only significant feature shortcoming is its lack of any 100Hz processing. The 32NX503's remote control is superbly designed; tactile, comfortable, responsive and well laid out except, perhaps, for a slightly misjudged 'concentric circle' button arrangement at its heart. Disappointingly, the onscreen menu is rather less immediately appealing, with its 'cross-axis' arrangement initially feeling slightly convoluted. But it only takes a little time familiarising yourself with how the system works for it to start to feel pretty natural. The first thing we sadly have to say is that we seriously considered only awarding the 32NX503 a score of three for picture quality. There are two main reasons for this. First, colours strangely lack the sort of vigour and vibrancy we're used to seeing on LCD TVs now – including many of Sony's own models. This additionally means that colours occasionally don't look completely natural in tone. Secondly, the picture looks slightly soft, even when watching in high definition – something that's mostly down, we suspect, to some slight, but consistent, motion blur/response time issues. HD images still manage to look detailed and engaging, though, despite their slightly soft tone, and the Bravia Engine processing guides standard-def images up to the screen's full HD resolution without making them look noisy or bitty. The set's black level response is mostly very good, too. 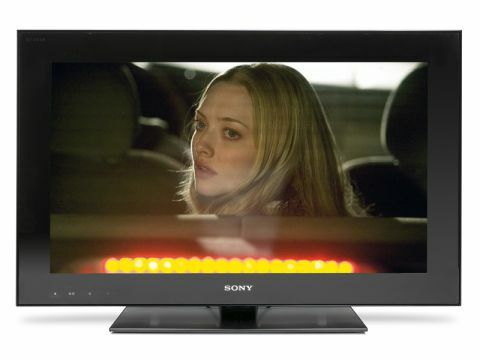 During dark scenes, we were really struck by how grey-free black colours look, and by the almost complete absence of the sort of backlight inconsistency issues that have blighted so many recent Sony TVs. Admittedly, the set has to sacrifice quite a bit of brightness to make these black levels happen, but it's a sacrifice we generally felt prepared to make. Though if you have a particularly light living room, you might not feel the same. Colours compensate for their occasional tonal issues, meanwhile, with subtle blends and expressively fine shifts, and while motion might not be entirely crisp, at least there's no sign of the overt smearing noted with some of Sony's previous relatively budget models. The 32NX503's strongest audio point, its talent at bringing out treble detail in a mix, is also its biggest problem. For with precious little bass on hand to provide a counterpoint to all the trebly stuff, the soundstage can sound rather tinny, especially when the speakers are being driven hard. Although it doesn't quite have the performance power to rate as a real bargain, the 32NX503's multimedia features are unusually comprehensive for a £700 TV, if that sort of thing is your bag.